Add a little sparkle to your outfit, with this elegant pair of pear shaped drop earrings set with sparkling stones. 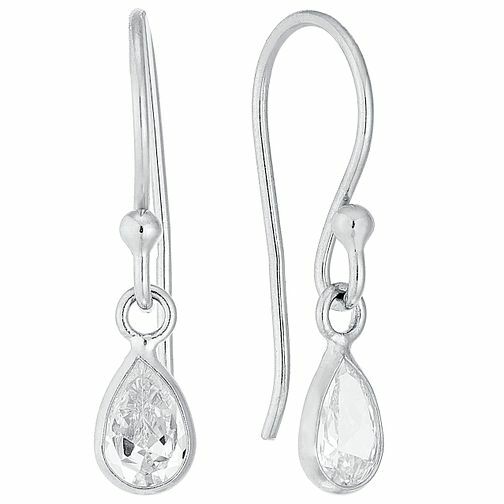 Sterling Silver Pear Shaped Cubic Zirconia Drop Earrings is rated 4.3 out of 5 by 13. Rated 3 out of 5 by Anonymous from Too small I bought these earrings from the thought of an adult person but they definitely are earrings for a girl who are very small. The picture is very enlarged and it can be misleading. Rated 4 out of 5 by Anonymous from Nice Nice small petite drop earrings perfect for day to day wear.